With the Get Fit Giveaway complete, it is time for round two. This one comes courtesy of our Friends at Mimobot. In case you haven’t heard of them, and haven’t followed our coverage (For shame! 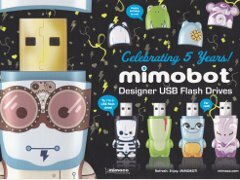 ), the folks at Mimobot are the makers of some of the most unique and creative USB flash drives around. When we talked to them at NYCC our own Oriech managed to convince them to give us a sample to give away to you, our faithful readers. They gave us a little fellow called Mictlantecuhtli. (I can’t wait to see if our man Phawx takes a stab at pronouncing that in our announcement video.) Much as we’d love to keep it, this drive was destined for a giveaway, and give it away, we shall. Either join up and comment here, or drop by the video and leave your thoughts there. If you comment in both places, we’ll count it as two entries. Now, Mimobot has got an awful lot of cool stuff. They even run contests to let the community have a go at producing new designs. (That’s how Mictlantecuhtli came to be.) Since we’re all gamers behind the scenes here at BrainLazy, we’ve got a few ideas for icons and underdogs of the gaming world who would fit the Mimobot mold pretty well. So if you really want to stand out when the time comes to pick a winner, let us know what video game character you’d most like to see storing YOUR data. You could even draw us a picture, if you are feeling energetic. Though this is strictly a BrainLazy curiosity, we’ll pass along your suggestions when we announce the winner all the same. Who knows? If a good enough idea comes around, we might be reporting a new line of VG Mimobots! Stranger things have happened. Wouldn’t mind seeing a Ryu Hayabusa mimobot. NES Ninja Gaiden version, first game I ever beat, so many years ago. Bonus points of they have mini drives for a small amount of space as little ninja stars! Man* sorry, I’m mobile right now. Men, I just realized how un original that was. If you are making a new from scratch design, make it a spider. For some reason, I feel like a spider design will really catch on. Wow, first comment on here too! I’d like to see a pokemon storing my info maybe even a little set of pokemon that come in a series of usb’s? Lol. Hope I win!